They lie glistening on beds of frozen crystals in the great food halls of North America and Europe. Bland and lifeless eyes regard busy shoppers as they push their carts in front of polished displays. Their silver-scaled bodies—plump yet strangely devoid of muscle—advertise the healthful benefits of omega-3 fatty acids and the singular bounty of the sea. Atlantic salmon, the king of fish and the food of kings, is on sale for three dollars a pound. Although reared in the ocean, these salmon live a life behind bars. They are raised in cages along the coasts of the United States, Canada, Chile, Scotland and Norway. They are genetically modified to accelerate their growth and liberally dosed with antibiotics and pesticides to mitigate the spread of rampant disease and parasites. They are fed a diet of ground-up fish containing chemical dyes to give their flesh a rosy hue. Some of their tribe escape through holes in their cages and enter rivers where they compete with wild salmon. It’s an old story—greed, disinformation, a willful disregard for the health of our most sensitive and bounteous ecosystems—and one that is unlikely to be told as the butcher hands you a carefully wrapped filet. 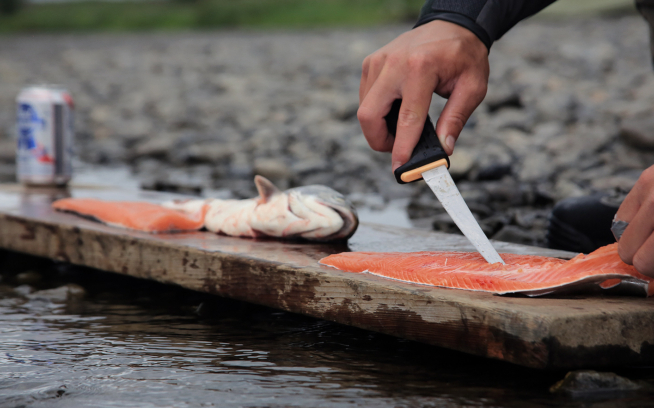 Global production of farmed salmon has recorded exponential growth in the last 20 years. Salmon farming (aquaculture) is a thriving industry along the coasts of Maine (U.S.A.), New Brunswick and British Columbia (Canada), Scotland, Norway and Chile. Proponents of salmon farming maintain that the expansion of the industry relieves pressure on ocean fisheries while introducing a sustainable and healthy protein alternative to the general consumer. Unfortunately, these claims are not supported by the industry’s abysmal environmental record. 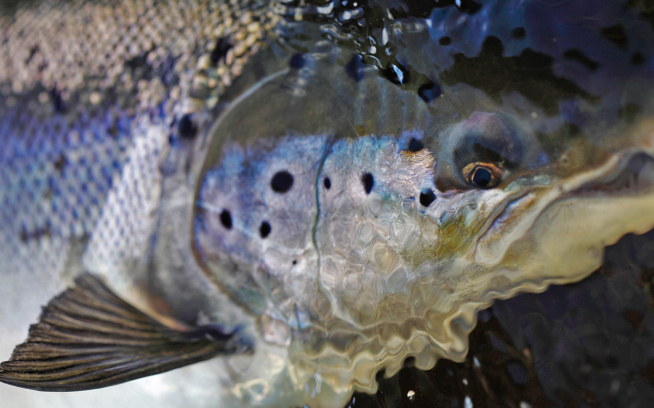 Certain species of Pacific salmon are even more vulnerable to sea-lice infestation. A single sea louse on a Chum or Pink salmon fry (juvenile salmon) can be fatal. An article in the peer-reviewed magazine Science (December 14, 2007) states that recurrent louse infestations of wild juvenile pink salmon associated with salmon farms in the Broughton Archipelago “have depressed wild pink salmon populations and placed them on a trajectory toward rapid local extinction.” Other species of Pacific salmon are similarly affected. 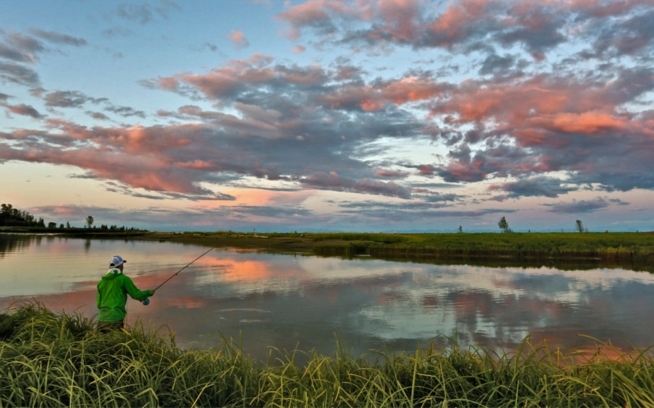 Projected returns of sockeye salmon to the Fraser River near Vancouver, British Columbia in 2009 are less than one tenth of their usual abundance (Reuters August 13, 2009). Our oceans are under siege. Pollution, ocean acidification and over-fishing pose serious threats to the breadbasket of a burgeoning world population. Salmon farming, once seen as a potential solution to reduced harvests of wild fish, is not a sustainable industry in current practice. Salmon farming must move to closed-containment systems on land in order to eliminate large-scale escapes of farmed salmon. Septic systems must process waste and the surfeit of antibiotics and pesticides generated by the industry. The presence of these chemicals in the treatment of farmed salmon also calls into question their essential fitness for human consumption. The science is in, governments are turning a deaf ear, and the clock is ticking.